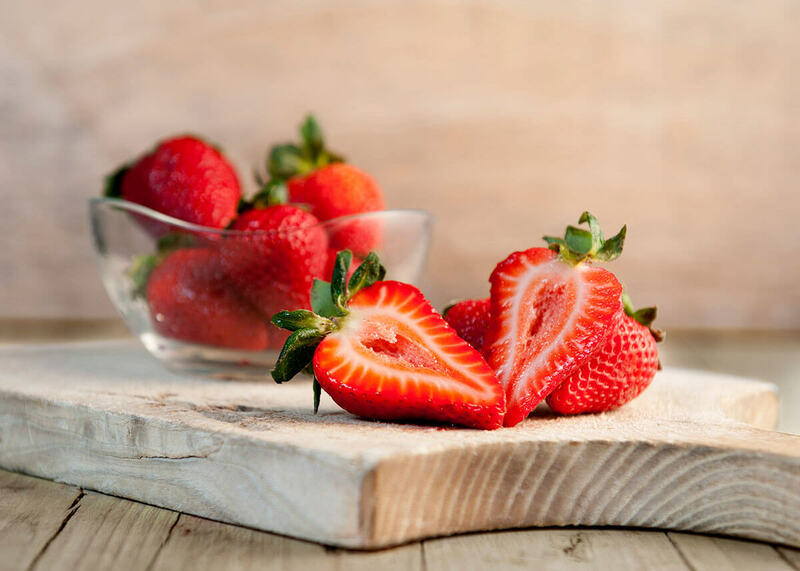 In addition to traditional nutrients, strawberries are also rich in phenolic compounds such as flavonoids and ellagic acid, which are the focus of intense study due to their antioxidant, anticancer and antimutagenic properties. The majority of flavonoids in strawberries are anthocyanins, the compounds responsible for the blue, red and purple hues of berries, grapes and other fruits. Strawberries are packed with vitamin C. In fact, one cup of strawberries has more vitamin C than an orange. Just one serving of eight medium strawberries provides 110 percent of the recommended Daily Value. An important nutrient to balance electrolytes, aid muscle contractions, and maintain a healthy blood pressure. One serving of strawberries provides five percent of the Daily Value for potassium. One of the B vitamins, researchers reported that people who eat strawberries have higher average folate intakes than those who reported not eating strawberries. Considered by the American Heart Association to be important for heart health, dietary fiber has health benefits such as lowering blood cholesterol and promoting a healthy digestive system. One serving, or eight medium strawberries, provides three grams of fiber. Key to warding off chronic diseases and promoting optimum health, research shows that the antioxidants in strawberries are efficiently absorbed within one hour after being eaten. In a recent study, strawberries ranked second among the top ten fruits in antioxidant capacity.